A gathering was held this week by SpinDizzians interested in Role Play or "RP". Some were suprised by the number of folks, about a dozen, who attended the meeting. Although a few of the attendees came due to the fact that the largest group of folks on SpinDizzy were there, almost all had some ideas to contribute to RP. Because some of the discussion was OOC or Out of Character and involved future RP events, I won't go into detail about those conversations. However Morticon, Tzolkin and new arrival Konoichi, all informed the group of ideas they had to make the lives of residents here more interesting and / or exciting. The meeting proved that there is a sizable number of folks interested in doing more than just chatting in the Rose Garden. A few noted that, although chatting was enjoyable, small "one off" RP's were enjoyable too. Different time schedules, coordination of groups, and different RP interests were also addressed. From all resports, the meeting was a success and Role Play interests are alive and well on SpinDizzy. Keep an eye, or whatever optical sensors you have, out for the results of RP plots that you may come across, and enjoy them! As some of you may have noticed, the paper has started being posted on Sunday evenings. I expect this trend to continue. When I began editing and publishing @Action News, my schedule of other responsabilities allowed me to have the paper edited and posted by midnight Eastern U. S. time Saturday night. However, changes in my circumstances, for the better, have made it more convinient to post the papers on Sunday evening. The later time has allowed contributors to submit work later and have it included in the current edition. So for the foreseeable future, @Action News will be posted at, http://www.spindizzynews.org on Sunday nights. If you'd like to contribute something, please feel free to e-mail it to, newspaper@spindizzy.org or, if you wish to remain in character and protect your player's e-mail address, feel free to use page #mail and send it to "newspaper" and we'll get it. The following is a transcript of an interview this reporter had with Kunoichi and Haruka, both local humans from Japan. In an unintentional faus pas, I understood that the polite suffix in calling Japenese folks by name was "san" for males and "chan" for females. I later learned that "san" is used for both males and females, and that "chan" is used when the subject is in a more friendly relationship than I am with either Kunoichi or Haruka. In learning of this, I appologized to both, and have corrected this transcript of the interview to reflect the correct suffix. The interview took place on the campus of the Kunoichi Corporation. The grounds are beautifully landscaped in traditional Japanese style, and as it was a beautiful day, the interview took place outside the headquarters building. I was told that construction was still underway and was not invited inside the building. After this interview a source who asked to remain anonymous due to the high security practiced by the Kunoichi Corporation told @Action News that a "Grand Opening" is planned at a future date. So, lets learn a little about Kunoichi and Haruka. 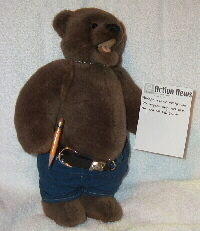 Argon says, "Thank you for taking time for me to interview the two of you." Kunoichi smiles faintly, "We found time during our busy schedules." Argon says, "I understand, and I appreciate you making time for this interview. I hope that it will help folks know the two of you better, and help your business." Argon says, "Kunoichi, you seem to be quite young to have such varied and substantial business interests. How did you get started?" Kunoichi says, "Well, the business is a.. family business. Passed down to me by my mother. I cannot remember a time where I was not involved in one way or another." Argon says, "So your parents were business people also. So this is a family business. Are they still involved?" Kunoichi shakes her head "My mother passed away some years ago." Argon says, "I am sorry. How did the business itself get started?" Kunoichi says, "The business has existed in one form or another since 1684. It's origins are lost in sands of history." Argon says, "My goodness! This is an old business. It must be quite stable. However, being from the same planet I am, you are familiar with the Internet, of course, and I found it strange I could find no mention of it in searching for background information"
Kunoichi says, "It depends. We have always had an.. exclusive clientel. Often, we never needed to advertise. Reputation alone in Japan was often enough." Kunoichi smiles wryly "We have no need of websites, Argon-san." Argon says, "Word of mouth is sometimes the best advertisting." Argon says, "I'm curious what it was about SpinDizzy that made you think setting up here could be profitable? I'm unaware of any products or services that are lacking here." Kunoichi says, "Well, it was more for tax purposes than anything else. We still have some business in Japan and in America, but I decided to move the corporate headquarters to a place where tax laws do not exist. We were also very curious at the very prospect of such a place." Argon says, "I see. So, Haruka, when did you join the corporation?" Haruka says, "That was almost 12 years ago, Argon-san." Argon says, "And what attracted you to Kinoichi Corp?" Haruka smiles "My aunt was an employee and I wanted to follow in her foot steps." Argon says, "So, just what is it that Kunoichi Corporation does?" Kunoichi smiles faintly "We provide specialized employees to businesses that require them. We specialize in security." Haruka nodnods "Much like a temp agency." Argon says, "Sort of like 'Manpower' or 'OfficeTeam' then?" Haruka giggles "Womanpower, more like it." Kunoichi nods "You would be correct, Argon-san." Argon says, "So you don't provide male workers?" Kunoichi says, "We currently do not have any. We very rarely have had any. It is said the business was started when the men went to war for the samurai and the women had to manage everything in their absence." Argon nods, "We had a similar situation in my country during WWII." Kunoichi smiles faintly "Then you understand perfectly Argon-san, except that this tradition stayed with us." Argon blushes, "My appologies. I meant no offense. That war is ancient history now." Kunoichi says, "I am not offended. History cannot be denied. It is passed." Argon bows slightly at the waist and says, "Arigato." Argon says, "So... you mentioned one of your employees being interested in becoming a centaur. Can you elaborate on that some?" Kunoichi says, "We have purchased this land from Sanogan-san, a noted fleshcrafter. 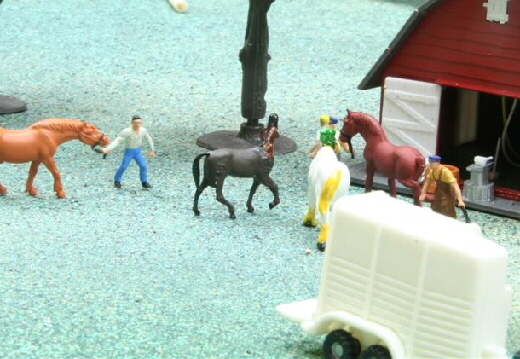 One of our employees was injured in an.. industrial accident.. and was curious about his services. She was rather curious about the centaur population is still considering joining it." Argon says, "Ah. Another female centaur would be welcomed by some of the males. I'm married, of course, but female centaurs are a rarity. I hope she considers her decision carefully though." Kunoichi says, "She is, which is why I have not revealed her by name. She has not made a decision yet." Argon says, "Finally, is there anything you'd like to say for the readers of the paper to know or consider about you and your company?" Kunoichi puts a finger to her lower lip and ponders. She smiles "The population of Spindizzy will be seeing a lot of us in the near future. My employees will be quite visible in public places, making observations, compliling data. Feel free to say 'hello'." Argon nods and makes a final few notes in his notebook which he then puts away, "Kunoichi-san, Haruka-san, Arigato for your time and information. This will make an interesting article." he bows slightly at the human waist. As an added note, it seems that most everyone I have met from Kunoichi Corporation has been, of course, female, and quite young. Kunoichi appears to be no more than 25 and looks younger while Haruka looks to be in her teens and I understand she has been with the company for 12 years. After this interview I met Momo, a human child of perhaps seven years old and works for Kunoichi. I'm unsure if she is working full or part time, what her schooling arrangements are, or the status of Momo's parents permissions and attitude over their child working at such a young age. I should also note that everyone I have met who is an employee of Kunoichi Corporation wears charcoal grey. 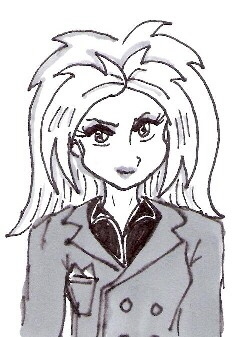 Looking very much the businesswomen, Kunoichi and Haruka have always been dressed in business suits, where as Momo wore a somewhat formally cut charcoal grey jumpsuit. Back in the olden days, when Canada was a part of England, a strange site was seen by a fellow named Crisco. He claimed to see what he could only describe as a "mousecat". Being a Mountie, he reported to his supioriors what he had seen, and his report was forwarded to scientists and scholors back in England. They studied his report and were astounded by his observation that the "mouscat" had four ears. "Due to the laws of nature and those of symmetry we accept the count of Mountie Crisco and deny that of the three mousecat ears." Q: Why don't balloons make good economists? A: They have no concerns about inflation. Q: Why do balloons often have a hard time finding employment? A: Many of their chances are blown. Q: Why don't androids need to eat fiber? A: They're as regular as clockwork. Literally. Q: What kind of car horn do bionic people use? Q: How do you evacuate an injured elastic coati or chipmunk? Q: What's the most waterproof automaton? Q: What's a good use for one on your riverboat? Q: Why is it so easy for illusionary people to diet? A: They contain hollow grams. Q: How do automatons feel when their schedule is disrupted? Q: And how would you describe one? Q: Why do so many romantic relationships between Cartoons and the English end in tragedy? A: Ask an English person for a "rubber" and see what you get. A few days ago I found a fun-looking book while foraging with a friend, and as I flicked through it, I realized it was just such a fabulous folio, and got fully fixated on the furry folks Pamela Duncan Edwards had unexpectedly forced upon me. "Four Famished Foxes and Fosdyke" tells the fable of a family of five foxes, whose mother flew out to Florida for five days to visit with some friends. Four of the foxes figured they'd find food on a farm not far away, but the farm's fowl fought back fiercely, and the foxes were foiled. Fortunately, their brother Fosdyke fixed them some food from the fields, various kinds of flora and fish. The other four foxes found that despite their former feelings, the food filled them up fine, and tasted fantastic. Fosdyke's lesson for his family was, "A fox is a fox, whatever the food." For sure you've figured out by now the flow of this fantastic fable. Furthermore, the fine artwork fit the feeling of the story. From their fronts to their fannies, Cole's foxes looked fabulously fluffy, and their faces showed exactly what they were feeling, from fear to frustration, and finally to fulfilment (following Fosdyke's feast). Flo, especially, the fine female fox (Fosdyke's sister), found me falling for the whole family. From a fairly brief flipping of the pages, they already felt like fast friends. 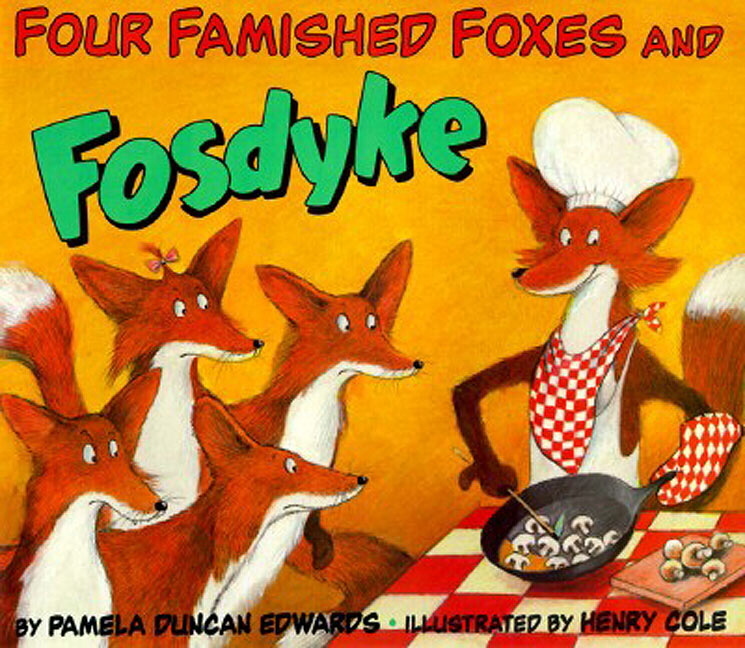 I found "Four Famished Foxes and Fosdyke" fully fascinating, and feel you should flip through it for yourself, or for your family. Here are the answers from the previous week's name scramble puzzle. Hi there. Here's your Spindizzy @Action News survey for this week. Do you think that the SED will be restarted? Ba'ar growls, "I certianly hope so. We need more laughs around here." Borris Gruffs, "Da, it will! And then the Kunoichi Corporation will have competition." Tanuki barks, "Yes, whether it has the same people in it or not. Assuming they're not absorbed into each other." Ceredwyn says, "Yes, I think it will be restarted soon enough. I'd be surprised (not to mention disappointed) if they wouldn't be." Argon says, "Ha ha ha hah ha ha," he gasps, "Oh ho ho hee hee hee! That's a good one. Next you'll be telling me lemurs don't like zinc! Ha ha ha ha ha hah ha ha ha....."
Natasha says, "'Will be'? That's overly pessimistic, thinks I." Darius says, "Restarted? It would have to have stopped for that to happen." They may be "Horse-like but not like a horse", but a blacksmith can still do the best job of shoeing a centaur.